I used to have an old Dymo Label Maker. And I still have parts drawers with labels I made in the 70's. But it's long gone, and who knows if they even make the tape anymore? So when I finished my variable power supply, I started looking for new labeler, and decided to try the Epson LabelWorks LW-400. The verdict: pretty good for about $25. It can print either 1/2" or 3/4" tape, 1 to 4 lines tall. It can print horizontally or vertically. It can even do barcodes and cable tags. It has a few features I'll probably never use like fancy fonts and borders. But I like it because it gets the job done and didn't cost too much. It came with white on black tape, which is probably better on light colored items. I think it looks better. There are a lot of tape and print colors to choose from, I think the white on black is probably the best for black plastic project boxes. Then again, the gold on black might look pretty good too. It's been several weeks since my last post. I've been busy with the Raspberry Pi, learning Linux, etc. building towards an RF base station, data logger, web server for the home energy monitor project. I'll be posting about that soon, but first I've got a couple small analog projects to share. I was at Radio Shack checking out their clearance table and came across a Velleman 1A variable power supply kit, for only $5, and couldn't resist. I've already got several power supplies, but none are variable. 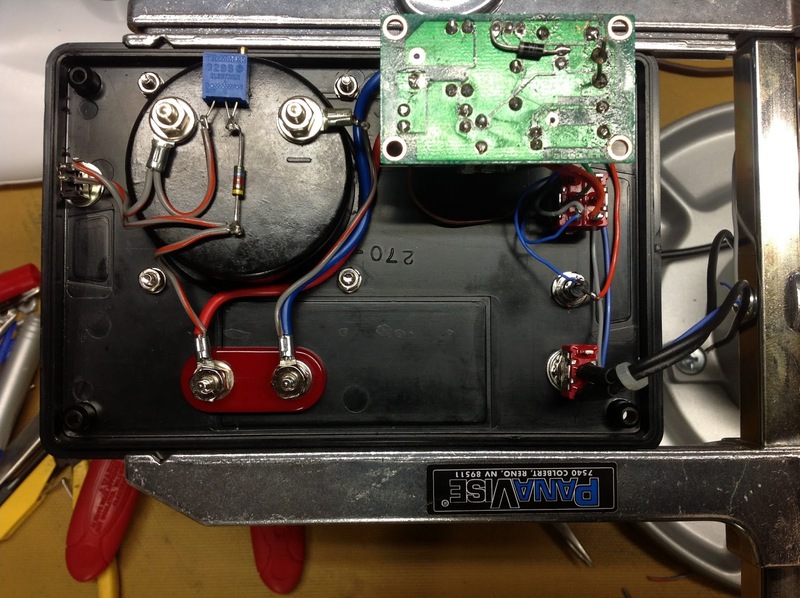 The kit includes a PCB, LM317 adjustable voltage regulator, resistors, caps, and bridge rectifier. It came with a trimpot, that I upgraded to a front panel mini-pot with a knob. The kit doesn't include a transformer, but I already had a 12.8 Vac, 1.2A transformer from my junk box. 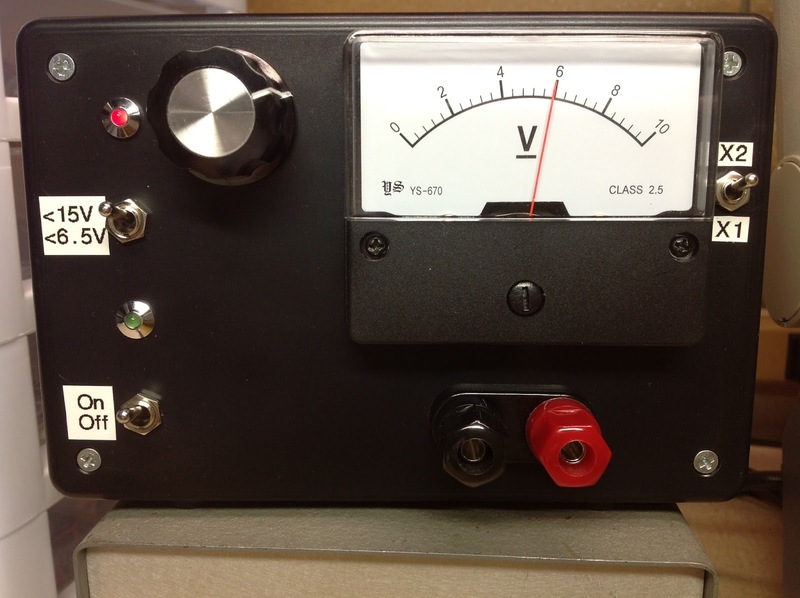 I wanted my supply to have two output ranges, to make it easier to set the desired voltage. After several iterations on the solderless breadboard, I settled on the circuit below. I experimented with the values for R1, based on the the 10K linear mini pot I already had for the front panel. 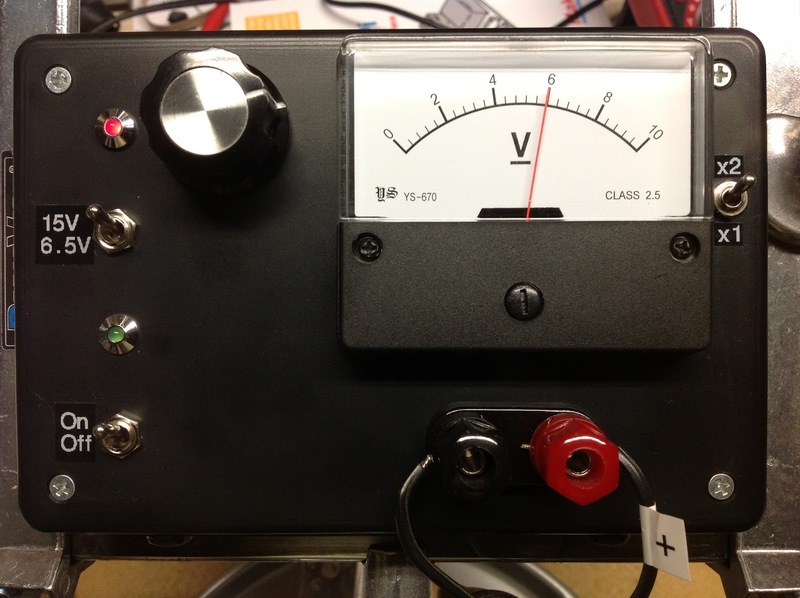 I also wanted an analog voltmeter, mostly because they look cool, and also because it's darn handy to adjust the output, without having to drag out a DVM. I found this one on Amazon, and it worked out great. I also added the protection diodes shown above and discussed in the TI data sheet. 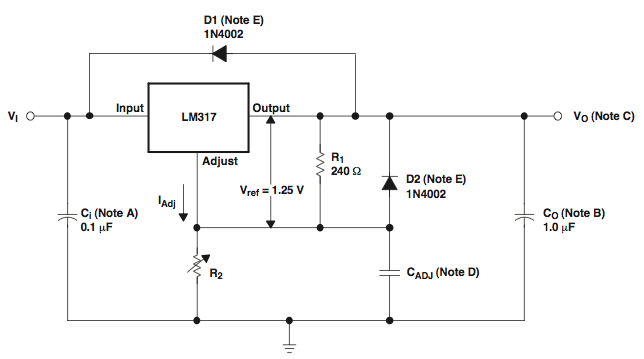 These protect the LM317 from reverse currents, under various fault conditions, e.g. connecting a higher voltage supply in parallel with the output, or shorting the input. Probably never needed, but they're cheap insurance! I used heavy-duty double sided 3M tape, to mount the top of the 2200uFd cap to the bottom of the mini-pot. The trimpot on the back of the meter is to adjust the 2X calibration. Here the supply is set for 12 volts. I also got a new Epson Labelwriter LW-400, and put it to good use. Next up: a cellphone headset booster amp.